happy happy joy joy! It's time for more Peachy Keen Stamps to come out! This month is a real doozy! Not only is the Stamp of the Month set a real beauty, but the other add-on sets are fantastic and the Peachy Picks Kit is perfect! 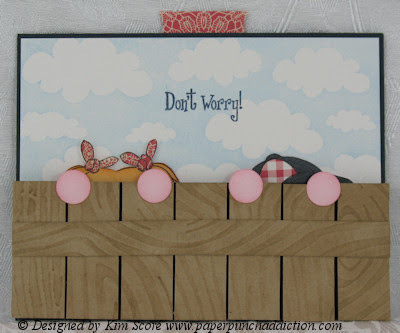 Today, I'm going to show you this little slider card I made with the July Stamp of the Month set. I also used papers from the Peachy Picks kit. I can't show you the goodies until Thursday when they officially come out, but if you come back here, you'll get to see all of the images. They are truly wonderful! Be sure to head over to the PKS Blog to see all of the other fantastic projects by the design team HERE. For the slider card, when the slider is pushed down, the little kids are hiding behind the fence. When you pull the tab up, their heads pop up. This technique is detailed on Splitcoaststampers HERE. I modified it so that instead of a message popping up in the front, the kids pop up instead. It's so super easy, give it a try! Absolutely adorable, Kim! Those kids put a smile on my face as soon as I saw them. What a super cute card! I am going to attempt it!! Kim, this card is so adorable! I love it! ~Hugs!! This is so cute and creative! I love it! This is so cute - very creative! One of my favorite of your projects! Wishing you a happy day! No other word will do......BRILLIANT! Kim ~ this is just ADORABLE! I LOVE the slider card and Thank You for the link to the tutorial! Everything is done to PERFECTION! What a CUTE release! What a fun card. This is so super adorable. Love it. Oh so cute, creative and really inspirational Kim. The faces say it all! !